What’s better than the taste of fried food? Fried food with fewer calories! Eliminate the guilt when you eat air-fried food! The air fryer gives you taste without the calories! We love our air fryer. Seriously love it. Despite its cuteness (it looks like R2D2 on our counter), our air fryer delivers yummy food in very little time. Technically, the device doesn’t “fry” food. It’s a mini-convection oven that circulates hot air around the food. You put your food in the basket along with some oil and turn the machine on. Excess oil drips down to the outer basket, where it’s easy to clean out. The result is delicious! The picture above shows a dish we made recently – just sliced zucchini and peppers. You can see the start of nice caramelization – we couldn’t wait to dig in. 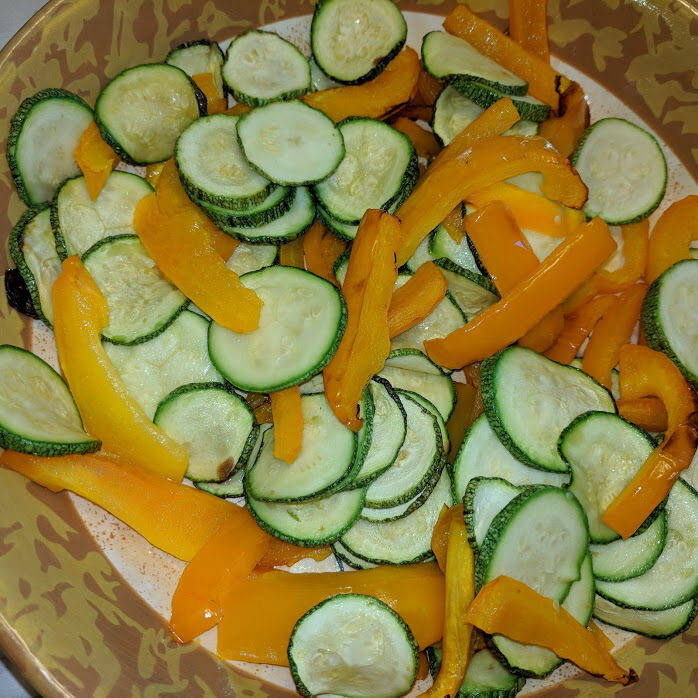 We put sliced vegetables in the air fryer and tossed them with a teaspoon of olive oil. Set the fryer at 400 degrees for 8 minutes or so. When it beeped, we shook the basket and reset the fryer. We could have let it go another few minutes but we were hungry! Delicious! So much more tasty than steaming, with not many more calories. We’ve sliced sweet potatoes and air-fried them. Absolutely scrumptious. And Yukon Gold Potatoes too. We’ve even re-heated gyros meat. All the fat from the meat dripped into the lower basket and the meat was crispy and delicious. Even after a few months experimenting with our air fryer, we’re still learning new ways of using it. We’re trying new foods and, honestly, have not been disappointed. Check this one out on Amazon! (I may receive some form of payment if you click this link.) You may notice some product links on the “Stuff I Love” page. I will only include products that I really do love. The air fryer? It makes me very happy, and my taste buds delirious!